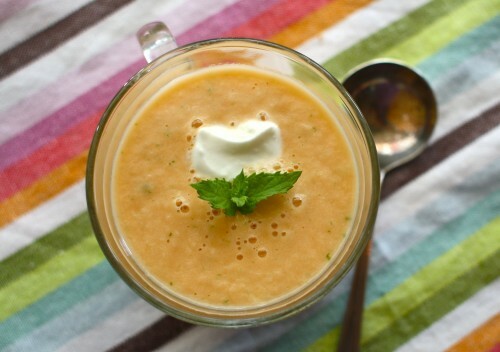 Chilled soups in the summer are a delicious treat. They are refreshing and flavorful and oh, so easy to make. Although I love a classic warm soup, the rising temps are keeping me far away from my beloved soup pot, but that's OK! Especially since my blender has been serving as a trusty alternative. This week, I also discovered three (well, six if you count the three recipes that Simple Bites featured) that have tons of flavor, use minimal ingredients and the only extra work you have to do is blend. Which one sounds good to you? Cool and Creamy Tomato Soup - I love tomatoes (as you can see by my tomato pesto soup), so including this cool and creamy tomato soup was an obvious choice. Created by Thousand Soups, another website devoted to soup, the recipe includes cucumbers, green onions, garlic, sour cream, stock and dill. Even better? There is no cooking involved. Simply blend the ingredients for instant soup! Cold Basil Soup - Oh, how I love basil and reading about The Special K Treatment's cold basil soup, I can see she is a fan too. Other than glorious basil, the cold soup includes cucumbers, tomatoes, onions and garlic. Simply blend the ingredients together with water and yogurt for some yummy cold soup. Three 3-Minute Chilled Soups - Aimée of Simple Bites created three (yes, three) cold soups that can that only take three minutes to make! A chilled yellow tomato soup, cantaloupe soup with lime and basil and a chilled cucumber soup with mint and yogurt are the featured recipes, which all sound pretty amazing. I am really excited to test out the cantaloupe soup that includes an interesting blend of yogurt, ginger, lime and basil. Even better, Aimée mentions that this soup is her "children's favorite" -- reason enough for to me give this one a whirl. Reposted with permission by emak -- Thanks Emily! There has been a lingering heat wave for the past few weeks which makes turning on the stove an activity I’m trying to avoid like the plague. Cold foods which require no or minimal cooking is ideal. I found a cold cucumber soup recipe on www.maangchi.com and decided to make it for dinner. The recipe is extremely simple with only a handful of ingredients needed. It’s definitely not what one would think a soup to be, but it’s absolutely refreshing…a cold hot (spicy) and sour soup per se. Get a bowl ready, one that can hold more than 2 cups. One that is made of glass looks the best. 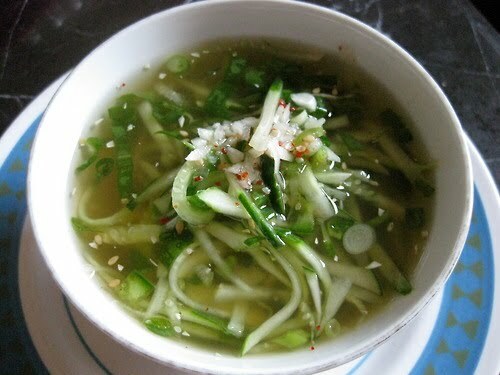 Put about 1¼ cups of cucumber, cut into thin strips (julienne style), into the bowl. Mince one clove of garlic, chop up half a green onion, and cut up 1 or 2 ts worth of green chili pepper (depending on how hot you like it). Add them to the cucumber strips in the bowl. Add 1 ts of salt, 1 ts of fish sauce, 1 ½ tbs of vinegar, 1 ts of sugar to the bowl and mix it well with a spoon. Pour 1½ cup of cold water (purified or boiled and cooled down) to the bowl and mix it. Cut some red hot chili pepper to garnish and sprinkle on the top of the soup. To read more about Emily's culinary adventures, check out her blog: eating with emak. When Serena asked me to do a guest blog post, I was excited both because I've been on a serious raw food kick this summer, and because I've been too lazy to update my own blog. Raw soups are great when it's sweltering outside (like it currently is in Brooklyn and has been for what feels like an eternity), since you only need a blender. I love to whip this one up for lunch on a Monday, because almost all of the ingredients are great natural detoxers, and I can undo all of the damage I did over the weekend—usually of the wine and pizza variety—and start fresh. A couple of notes about the recipe. While most raw soups can be chilled beforehand, this one should really be served right away, otherwise the avocado will oxidize and start to turn brown. Nama shoyu is raw, unpasteurized soy sauce, usually sold at health food stores. Regular soy sauce is a fine substitute taste-wise, though the soup will no longer be 100 percent raw. Enjoy! Place all ingredients in a blender, and blend on high until smooth. If soup is too thick, thin with additional water. Top with sprouts, if using, serve immediately, and enjoy! 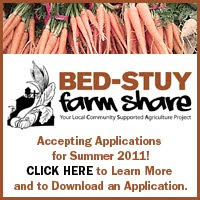 To read more recipes by Jess, check out her blog: Jessica Hulett -- Chef, Writer and Modern Day Hippie. Chilled and veggie soups are all the rage for the summer, and and it's easy to see why: they're light, easy to prep and taste pretty darn good. Here are some veggie soups that caught my eye this week. 1. 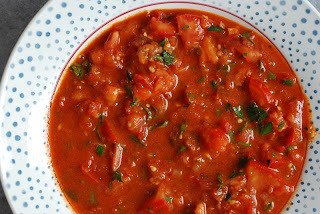 Barbara Kafka's Moroccan Tomato Soup- While reading The Wednesday Chef's tale of soup-making I couldn't help but smile. I, too have had a hard time creating soup with the heat (hence the lack of posts), but when there is some relief I quickly figure out what the next soup will be, gather up my ingredients and start cooking. Luckily for us, the WC had a break from the heat and was able to hop on her bike, locate some yummy tomatoes and get cooking. 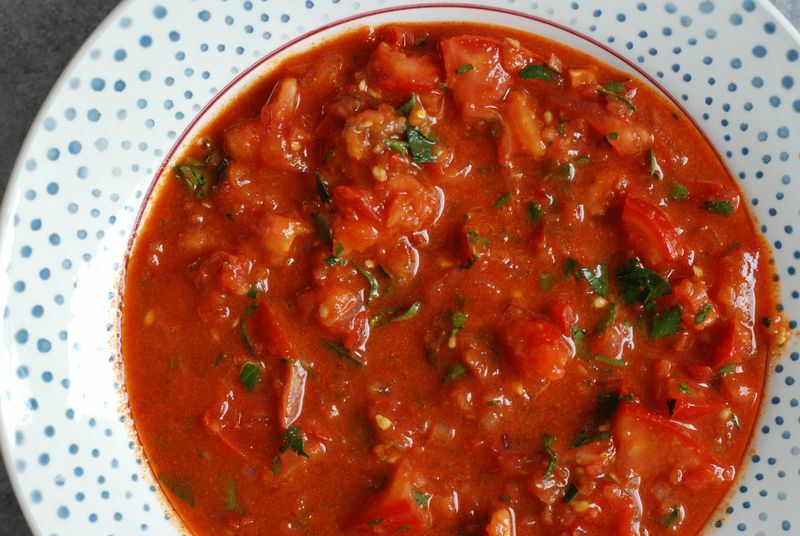 Her hearty (and I mean hearty) tomato soup is packed with spices (cayenne pepper and cumin), cilantro, white wine vinegar, lemon juice, and of course tomatoes. 2. Puree of Turnip Soup - I have yet to use turnips in a soup, but I'm thinking that is about to change, especially after reading about Julie Morris' Puree of Turnip Soup. Another simple one -- Morris added broth, potatoes, onions and turnips -- with an interesting addition (almond milk) that may also make an appearance in future soupy's. 3. 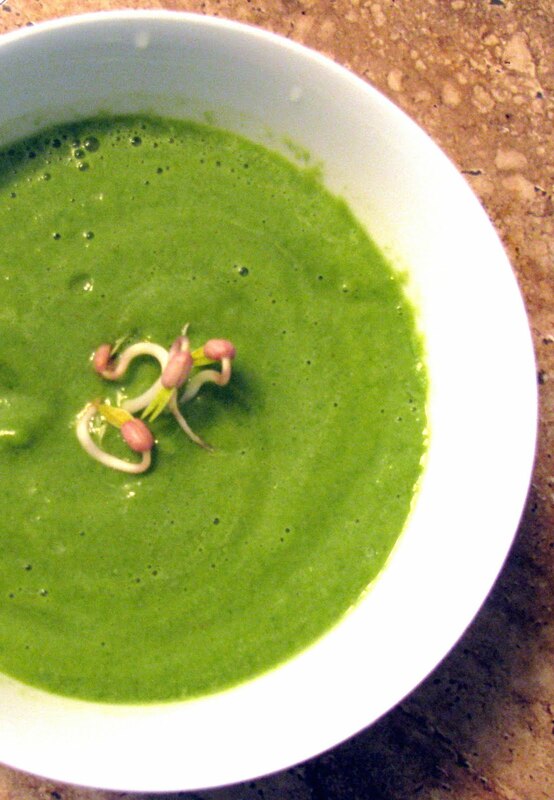 Asparagus Soup- The beauty of this interesting-looking vegetable is that it is not only tasty (in my personal opinion), but it is also very versatile in soup. Food Junta's white asparagus soup -- inspired by recipe from Emeril Lagasse uses shallots, leeks, heavy cream and stock that is good to go in an hour. What new vegetable soups have you made this week? The heat wave in NYC has made the whole soup-making thing quite difficult (to say the least). Of course there are chilled soups, but making anything in general has not been favorable, especially when there is ice cream! However, there was a bit of a relief today (with temps in the upper 80s), and thanks to the farmers market I was inspired to break a sweat and make a soup. I found these gorgeous tomatoes -- a mixture of orange, heirloom and green -- and decided to use them as a base, along with homemade pesto. But, I must warn die-hard pesto lovers: my pesto isn't 100% authentic -- more of a variation used to compliant the soup. This light summer soup was so easy to make, leaving less time to sweat and more time to enjoy this delicious basil and tomato soupy. Let me know what you think and I'm hoping to try a chilled number next week. Stay cool! Start by boiling water into a medium-sized pot. Dice tomatoes and place them into the boiling water, along with the fresh basil, sage, and salt. Cover the pot and start making the pesto. Mash the pine nuts. I used a rolling pin, but you can also use a sturdy can or grind them in a blender. Chop up the basil (very fine) and place it in a bowl, along with the pine nuts olive oil, basil, lemon, salt and pepper. Place the pesto mixture into a blender until the mash is semi-liquefied -- (the grind setting did this nicely!). There will be some chunks, if that bothers you continue to blend. Add the pesto to soup and cover. Let cook for 15 more minutes, tasting the soup along the way. I ended up adding another cup of water. Turn off the flame and enjoy!